Caroline Smulders: On se retrouve à Londres le 20 mai ! Je suis heureuse de vous faire part de ma participation à Photo London au Somerset House (Londres) du 21 au 24 mai 2015, stand C11. Pour cette édition, l’oeuvre de GERARD MALANGA sera présentée en focus, mêlant tirages vintages et contemporains. 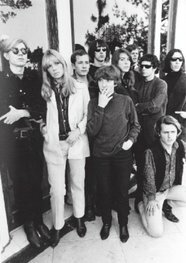 Né à New-York en 1943, poète, photographe, réalisateur, Gerard Malanga a été de 1963 à 1970 le bras droit d’Andy Warhol, avec qui il crée le magazine Interview en 1969. Il a marqué une grande influence sur les œuvres et films réalisé à la Factory. 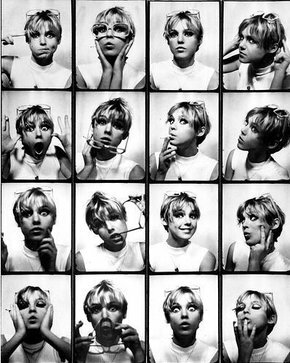 Le New York Times le qualifie d’ailleurs «d’associé le plus influant de Warhol ». Nous montrerons également KIMIKO YOSHIDA avec deux nouvelles sculptures, une originalité pour cet événement consacré à la photographie. I am glad to announce my participation at Photo London at the Somerset House from 21 to 24 may 2015, stand C11. 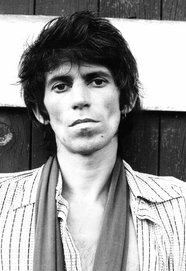 I will show a selection of GERARD MALANGA’s vintage and contemporary silverprints. Born in New York in 1943, Malanga was a major influence on many of the paintings and films in Andy Warhol’s studio, known as The Factory. The New York Times called Malanga “Warhol’s most important associate”. 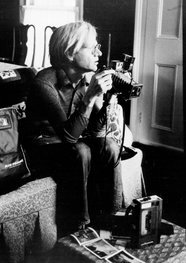 Besides starring in several Warhol films, he and Warhol collaborated on nearly 500 individual three minutes “Screen Tests”, which resulted in a selection for a book of the same title, published by Kulchur Press. We will also exhibit KIMIKO YOSHIDA with two new sculptures, a way to say that a photographer can also move into the three dimensions. tirages plus récents ( publication). Européenne de la Photographie samedi 15 novembre à 18h.Je serais ravie de vous voir à cette occasion. Poète bohémien, photographe des mémoires vivantes, cinéaste expérimental, acteur malgré lui, Gerard Malanga (né en 1943 dans le Bronx) est rentré dans l’histoire lorsqu’il fut engagé un beau jour de juin 1963 par Andy Warhol en tant qu’assistant avant même que la première Factory ne devienne le haut lieu de la multi créativité new-yorkaise et au-delà, des Silver 60’s. Jusque 1970, ils vont collaborer amicalement et intensivement pour produire des chefs d’œuvres en séries jusqu’à ce que « l’ange blond de la Factory » ne décide de prendre son envol et de faire des nombreux talents / géants qu’il a bien connus des icônes aussi intemporelles qu’accessibles :Iggy Pop dans son plus intime et insolent apparat, William S. Burroughs tournant le dos à son héritage familial, Mick Jagger offrant sa bouche pulpeuse, Patti Smith et Robert Mapplethorpe en jeunes amoureux, Dennis Hopper et son étrange mélancolie, Candy Darling sur le pavé de la gloire…, consacrant leur profonde humanité, avec une élégante simplicité toujours bienveillante. Ces oeuvres sont d’avantage des témoignages d’une époque de créativité en liberté dont Malanga a été l’un des acteurs inspirés que des portraits réalisés dans l’intention de saisir des images de personnalités célèbres. 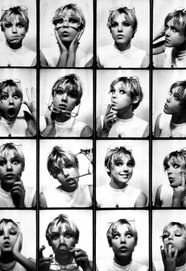 Pop, Art, Alive ! Vernissage VIP jeudi 13 novembre 2014 de 19h à 22h sur invitation. Soirée initiée par Sebastian Hau, directeur du BAL BOOKS et commissaire indépendant, dans le cadre du parcours VIP de Paris Photo. Echange entre Gerard Malanga et Sebastian Hau, rencontre avec le public et lecture de poésies. Durant toute la soirée, une projection de court-métrages de et/ou avec Gerard Malanga est prévue dans le cinéma privé du Silencio. Conférence-débat entre Gerard Malanga et Philippe Franck, historien de l’art. 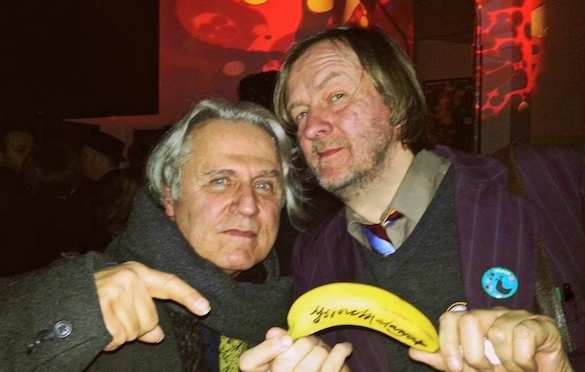 Cet échange avec Gerard Malanga permettra de passer en revue les grandes étapes de la vie artistique de Malanga ; de sa rencontre avec Andy Warhol, la vie à la Factory, balayer ses connexions avec la littérature (Beat Generation entre autre) ou la musique (découverte du Velvet Underground), et également son travail d’archiviste, de photographe, de réalisateur ou de poète. La conversation sera ponctuée d’extraits sonores, de films et de projections d’une sélection de photographies. 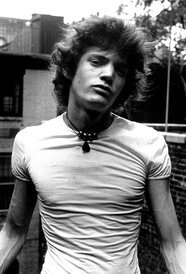 Gerard Joseph Malanga is an American poet, photographer, filmmaker, curator and archivist most famous, perhaps, for his work with Andy Warhol during the artist’s most creative period in the mid-Sixties. 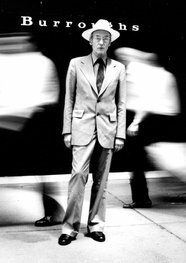 He was recently in Glasgow as the “official poet” of that city’s International Festival and while there he visited The Poetry Club to exhibit some of his photographic work, show a short documentary and to recite some poetry. For Louder Than War, BMX Bandit and long time fan of Gerard Malanga’s work, Duglas T. Stewart, describes how the evening unfolded. 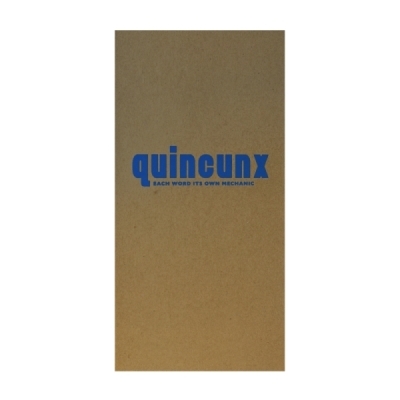 Quincunx is available to ship next week. Handsewn at the Sick Tangerine workshop. 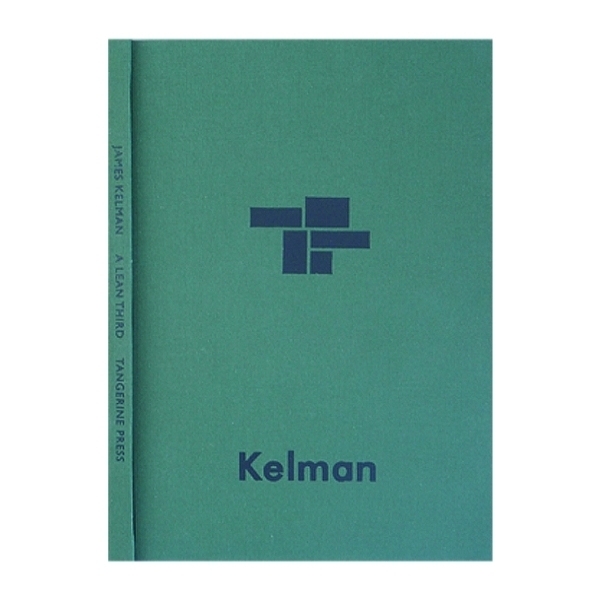 325gsm Cairn Almond stiff card covers, hot foil stamped with ‘Quincunx’ signature blue ink; 100gsm Heritage Book White acid-free text paper; 130gsm Hahnemuhle Bugra Butten Light Brown endpapers. 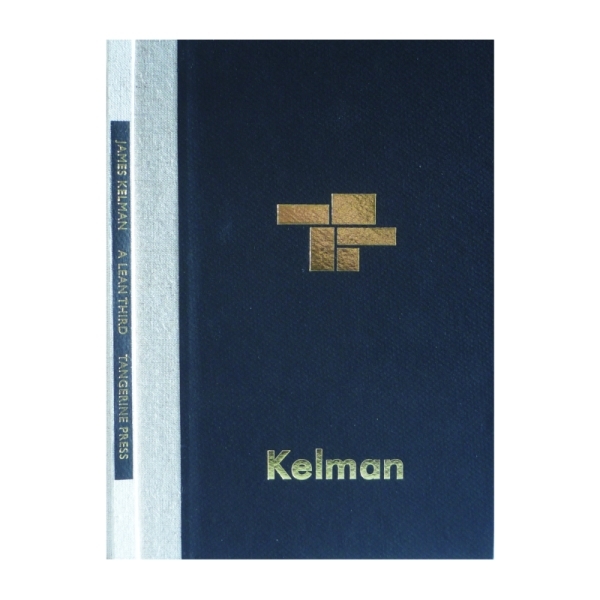 a new story collection from James Kelman, is now available for pre-order. For forty minutes last night, as sirens slashed the frigid silence outside and painted the inside of an art gallery emergency red, the poet Gerard Malanga read poems about eminent people he has known or studied—among them Gabriel d’Annunzio, Valerie Eliot, Edna St. Vincent Millay, and Gore Vidal. Malanga, as famous for his photography as his poetry, never gets in the way of a poem. His readings are singular acts of faith in the work. The actor Matthew McConaughey recently said in a similar vein that getting out of the way of a script is crucial to him. All recent, unpublished and never-before-read, the poems Malanga read at McDaris Fine Art Gallery in Hudson, New York, are keenly observed encounters with people, their natures and their intellects. Malanga’s is a fond eye. Often he is more interested in the companions of the famous than the famous. He is electrically aware of the circumstances and environs in which he encounters them. In one poem the novelist Saul Bellow wants to play softball and tries to rouse the sleepy young Malanga. The poem, like many others, suggests Malanga’s filmmaker’s eye. He remembers not only what people said, what they look like, but how they moved. 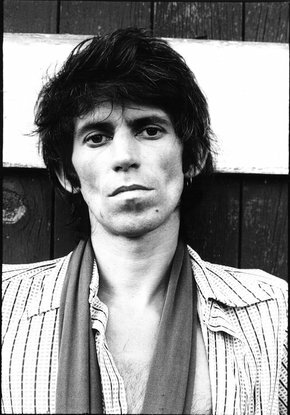 He remembers encountering, for example, the photographer Diane Arbus in the library of The New York Times, and in a few lines he gives us an Arbus nobody else has described quite so insightfully. 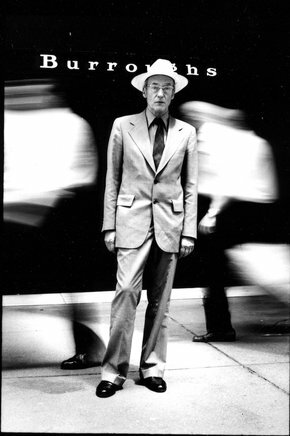 Describing William Burroughs, we get the writer’s cranky whisper. It would have come across in the words even if Malanga hadn’t mimicked the sound. Here are some of the other people we so memorably encountered last night: Chris Marker, Emile de Antonio, Faith Frankenstein, Dorothea Lange, Benedetta Barzini, a close friend of the poet, Jasper Johns, Cornelius Gurlitt, René Gresham, and Jim Jacobs. More than most poets, Malanga has spent a lifetime among fellow poets, artists, filmmakers and photographers, and in his poems we encounter them glowing with Malanga’s love for them. That is a rare achievement in any art form, redolent, say, of Johannes Vermeer’s unmistakable feelings for The Girl With the Pearl Earring. It is a tribute to Malanga’s personal style as well as his work that the audience’s response to his poems often consists of the silence of awe and the sort of murmuring that denotes profound impact. Rather than break his spell, the audience reserves its sustained applause for the end of his readings. People who frequent poetry readings will recognize this as a rare salute. « Dad 3, » a poem about vacationing with his father in the Shawangunk Mountains of New York, gives us an early and excruciatingly intimate glimpse of the astute observer Malanga would always be. But it gives us something else, something that bends a brilliant spotlight back on his earlier work. At some point he leaves his father and returns to a barn where he speaks to the animals in a language he has now forgotten. But Malanga has never fully forgotten that language, and it both informs and haunts his poems. The Millay Colony for the Arts and the Edna St. Vincent Millay Society, which sponsored last night’s reading, could not have chosen a more appropriate poet to receive its first Steepletop Poet of Distinction Award. (Greg Vogler, a Millay trustee, is shown here making the award). Malanga shares with Millay a clear voice, an undeterred eye, and, perhaps most of all, a gift for setting up a vibration that rewires the circuitry of a place and a time. Steepletop is the name Millay and her husband Charles Frederick Ellis, an artist and actor, gave their home in Austerlitz, New York, near Chatham. But what makes the award even more relevant is that Millay Colony and the Edna St. Vincent Millay Society share with Malanga a profound interest in other creative people. The gift Millay Colony presented Malanga last night is as appropriate as the award, a first edition of Millay’s What Quarry, Huntsman, 1933. Malanga is a book dealer and rare book collector. 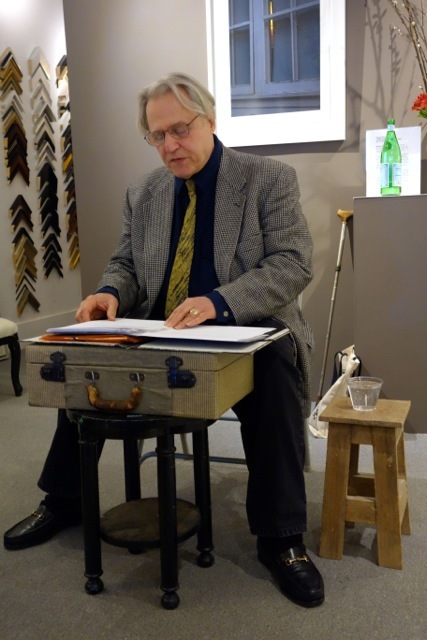 Reading from a portfolio on an antique suitcase, an inspiration of gallerist Wendy McDaris (shown here arranging Malanga broadsheets), Malanga and his overflow audience were surrounded by Millay artifacts, photographs, china, Millay’s typewriter, and first-edition books. 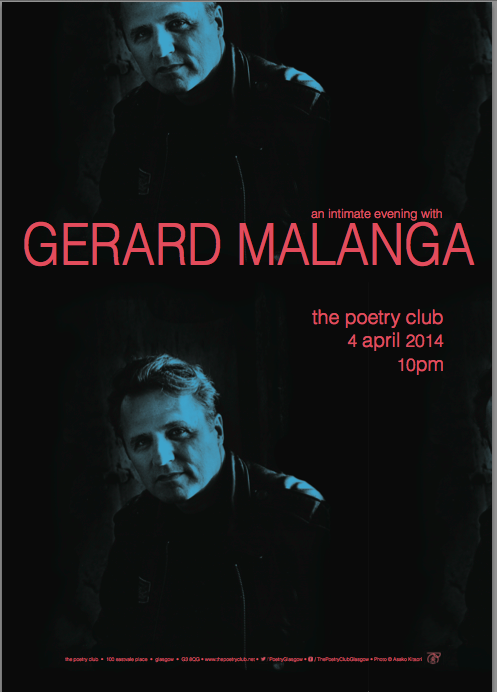 Malanga is the official poet of the Glasgow (UK) International Arts Festival, April 4.